The irises are gone, and just in time to console me come the evening primroses. Soon my garden will be a burst of yellow, brightening the yard at the little house in the big woods. The primroses always bloom in time for the Fourth of July, a special treat for the celebration of our country’s birthday. Thanks, Derrick! Those evening primroses certainly add a glow to the garden. Lovely! 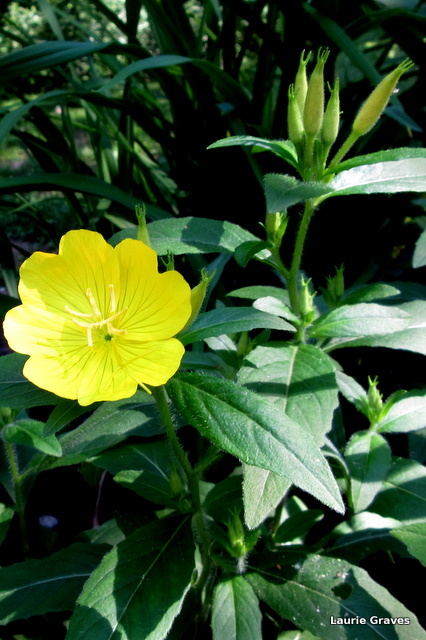 We have one plant of Oenothera fruticosa – it is an exceedingly sunny flower!